Mark Jones slides in to score for Peterborough Sports against Stamford. Photo: James Richardson. Peterborough Sports boss Jimmy Dean followed a career low-point with a glorious high over the hectic festive programme. The city side slumped to the bottom of Division One South of the Evo Stik League after a miserable Boxing Day loss at Spalding and a plucky defeat at title-chasing Bedworth last Saturday. Peterborough Sports boss Jimmy Dean. 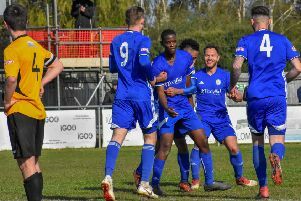 But a brilliant New Year’s Day win over high-flying Stamford AFC gave the club a massive lift ahead of their big relegation scrap at Romulus tomorrow. A Lewis Hilliard penalty and a Mark Jones strike defeated the Daniels at PSL. “We thoroughly deserved the win,” Dean enthused. “We had a bare 14 players, a couple of whom shouldn’t have played, but we battled hard and played well. We had a strong 11 out though. If I get that 11 out every week we would climb away from the bottom quickly. “We were awful at Spalding. It was probably the lowest point of my career, but although we went to the bottom after the Bedworth game we played pretty well and they had to score two great goals to beat us, so I wasn’t that surprised we beat Stamford, especially as we’d given them two tough games earlier in the season. Dean was full of praise for the Jones brothers, Richard and Mark who played against Stamford, despite not feeling fully fit. Centre-back Richard won the sponsors’ man-of-the-match prize. Sports still have a lenghty injury list, but key midfielder Lewis Webb could return tomorrow. Stamford dropped three places to seventh after their defeat at Sports ahead of a tricky game at Lincoln United tomorrow. Spalding are at Sheffield FC.